I’ve been interested in birds far longer than I’d had any conscious intention of approaching them with a camera. After all, they’re not the easiest or most obvious of subjects. They seldom pose at arm’s length, are seen under a wide variety of lighting conditions and at their most striking during flight. So it was not until I found myself living in Bermuda during the early 1970s that any serious attempt at photography became possible. These early efforts were, however, encouraging. On returning to the UK two lively sons and a demanding program of study precluded further efforts in this direction. Then, many years later, I moved to Australia where I had the opportunity to renew my interest in this work. During the interim period film had yielded to the digital revolution and a whole new suite of options – to say nothing of equipment – appeared. From the earliest days right up to the present I’ve never seen bird photography merely in instrumental terms, i.e., as a set of practical problems to be solved. It is that, of course, but also much more. 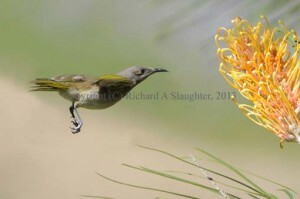 Then in mid-2011 I joined a Brisbane based bird photography group affiliated with the national body, Birdlife Australia. The latter had long been driven by a strong bird conservation ethic and supported a wide range of projects and related activities. The local group was mainly focused on the technicalities of taking and processing images. Both kinds of activities have their place. Still, the contrasts between different kinds of motivation drew my attention. Then in late 2012, when production of the photo group newsletter looked like being delayed, I volunteered to help out. The result was a couple of short opinion pieces exploring possible motivations for a serious and sustained interest in bird photography. This short essay is derived from the earlier ones. It offers a personal view that has developed and become clearer over time and I don’t expect everyone to agree with me. Yet, at the same time, certain commonalities seem likely. Four interlinked motivations are highlighted. These are bird photography as an antidote to suburbia, as a distinctive craft, as expressing certain values and, finally, as related to a primal need. Those of us who live in cities – even relatively ‘green’ cities such as Brisbane – know very well that the conveniences of urban life come at a certain cost: traffic, noise, pollution and an inevitable distancing from the ebb and flow of the natural world around us. In fact for very many people the latter seems to have receded almost entirely and is barely noticed at all until an inevitable ‘Act of God’ disrupts our normal patterns and expectations. Then we’re forced to deal with the sheer power and scale of natural process. Be it wind, rain, storm, drought, flood or fire, nature only gets the full attention of suburbanites when we are under this kind of non-negotiable duress. Yet even in quiet times suburbia is not devoid of life. As is well known, some species have adapted to urbanisation quite successfully. Kestrels nest in tall buildings. Magpies, Crows, Doves, Cockatoos, Corellas, Rainbow Lorikeets and many other species are found in and around nearly every street. Raptors soar overhead. Curlews peer at us uncannily from the edges of car parks. Channel Bill Cuckoos screech around the treetops every summer. They are among the many migrants that animate the suburbs each year. Some of the local birds create the ‘dawn (or pre-dawn) chorus’ – that we often hear on awakening. In our area it’s often a contest between Noisy Miners, Butcher Birds, Cockatoos and Lorikeets. 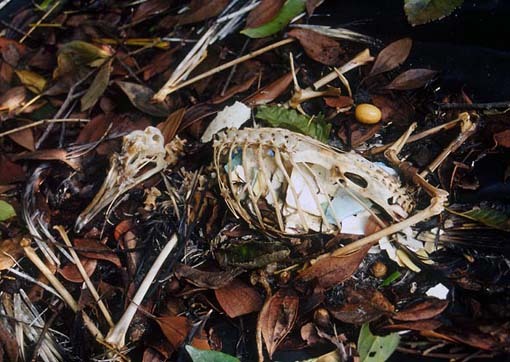 Unfortunately – and as is well known – many smaller species such as Wrens and Honeyeaters have been driven out, while the habitat preferences, food supply and so on of others preclude them from being more than transient visitors. We are fortunate, however, in SE Queensland to have access to an incredible variety of land and seascapes and hence to a vast variety of birds and other wildlife. Some bird ‘hotspots’ – such as Oxley Common or the John Wilson Reserve – are close to the suburbs. Others require a journey by road or air. One of the finest is Lord Howe Island which is about 90 minutes flying time from Brisbane. My wife and I have made two trips there, both of which were immensely satisfying and provided some first-rate photographic opportunities. 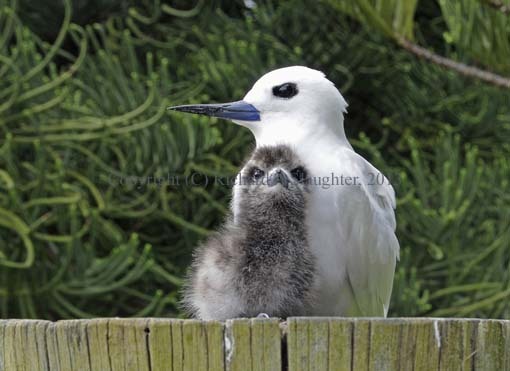 Figure 1 shows a White Tern with its chick on a bare fence post. 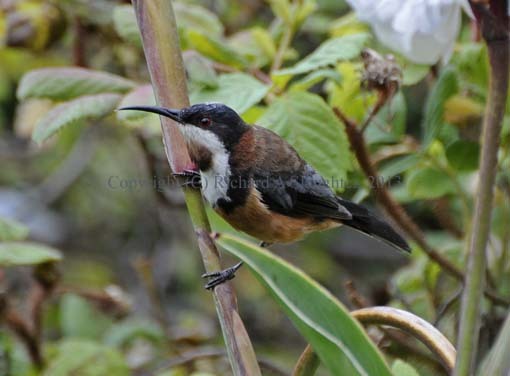 Then, on a trip to Port Arthur in Tasmania we unexpectedly found this Eastern Spinebill feeding in the formal gardens. Keeping one’s eyes open on all occasions brings many such rewards. On this particular occasion a careless tourist flushed the bird by running at it with a point-and-shoot camera. Fortunately I followed the bird’s flight and saw where it landed – in the middle of these bright red flowers. I don’t think you can begin to appreciate birds if you’re in a hurry. Thoreau was one of the great US conservationists who drew attention to the intrinsic values that can be associated with nature and I’m often reminded of the quote I’ve placed above. To spend a substantial amount of time in nature is not only deeply refreshing and energising. It also helps us to re-value ourselves and be reminded of our complete dependence on the wellbeing of the natural world. This is something our culture forgets at its peril. So, while we can certainly enjoy the birds that live among us, it’s also essential to also get away from suburbia. It’s worth relinquishing some of the conveniences and distractions of civilisation to re-connect with something far older and more primal. I’ll return to this below. To take up bird photography suggests, in part, that we value this process of ‘getting out into nature.’ We all need antidotes to suburbia and birds provide one avenue among many for so doing. But photography also involves so much more. As noted above one reason for the fact that bird photography can be so absorbing and challenging lies in the very nature of the subjects. As all who have tried it know, it is very difficult indeed to obtain high quality images of creatures that come and go as they please. This is especially the case if they are small and fast moving or elusive in their habits or behaviour. Whether we are conscious of this or not, to have any chance of capturing quality images requires something of a reversal of our usual habits and modus operandi. The reason, fundamentally, is that we’re no longer in charge. Rather, we learn to qualify, as it were, for the chance of getting close enough take the shot. We must, to a considerable degree, acknowledge their rules, their priorities and their ways of going about things. If we blunder around the countryside like high-tech cattle we’ll see very little and photograph nothing worthwhile. Counter-intuitive it may be but I think moving with care and sensitivity is something that many people positively enjoy. For one thing, it forces us out of our usual habits and routines. If only for a while we operate differently, put ourselves second, acknowledge realities of existence that normally either don’t apply or remain hidden in the background. The technical challenges are many. Knowing your equipment is essential. It has to become an extension of your self. Just as you don’t have to consciously make the complex calculations that allow you to walk or balance so you have to be able to adjust the critical parameters of your camera by instinct and feeling. Sometimes you’ll have time for calculation but at others things happen too quickly for that. This rare shot of a Brown Honeyeater in flight resulted from spending a couple of days last year at a single flowering Grevillea shrub at a friend’s farm near Maleny. By sitting still most of the time the birds grew used to me and I was able to get quite close. The camera and lens were adjusted very precisely to the conditions. I was attentive and relaxed. When the event shown here took place it all came together in one fluid moment. It’s worth repeating that learning the craft of bird photography is all about learning to enter the world of birds, seeking to understand them and taking time to simply be with them. Non-birders I have met frequently assume that this kind of photography requires a lot of patience. I hear this comment more than any other. But in my experience spending time with birds is an inherently rich and rewarding experience – although it can get certainly uncomfortable from time to time. What non-birders don’t seem to get is that when your senses are attuned to birds and the natural environment there are remarkably few dull moments. Rather, you find yourself in a kind of alert yet meditative stillness that misses very little. Then, at certain moments, you are fully engaged in following, tracking, monitoring what’s happening, just attempting to stay focused and ready. 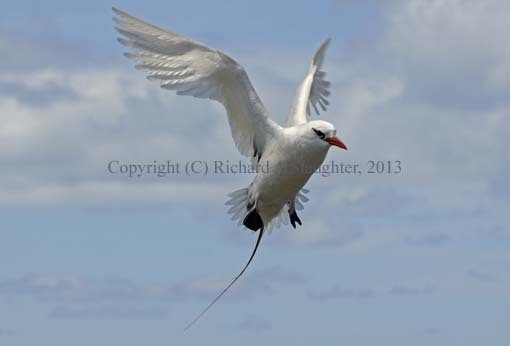 That’s certainly how I felt along the Cliffs of Lord Howe while photographing Red-Tailed Tropicbirds. Figures 4 and 5 show them in two quite different aspects: first, the beautifully streamlined form of aerodynamic flight; second, working against the air in order to slow down for landing. You soon learn that photographing white birds against the background of the sea is very different to doing so against the far brighter sky! Whether meditative or action-oriented, these experiences are absorbing and deeply satisfying. Another of the most delightful things about the craft is that we can be pretty certain that, however long we practice, and however much experience we gain, we’re unlikely ever to ‘arrive’ at some ultimate pinnacle of success. Well, a few might – the professionals, maybe. Oddly enough, while I respect these folk and appreciate their work, I don’t envy them. For me, being under pressure to perform and produce on each and every trip would detract from the pleasure and ease I currently enjoy. Like the chef whose reputation stands or falls on the last meal they prepared, the professional wildlife photographer may appear to have a glamorous occupation. But, as with other professions with a patina of glamour, tension and stress are ever there lurking in the shadows. Another drawback, perhaps, is that professionals tend to lug around quite heavy equipment to capture images of the very highest quality and, again, I think this affects the nature of the process. I prefer lightweight equipment that can easily be carried considerable distances and am prepared to seek quality in other ways. Bird photography is a complicated craft and, as such, it is best learned over time, slowly and in stages. Indeed, there’s no substitute for starting out as a dedicated birder. That is, someone who simply gets pleasure from being in the company of birds, who delights in their behaviour, their beauty and their infinite variety. That way one learns to handle a pair of binoculars, to walk quietly, to observe, to take note and to see in some depth and detail – a core skill and necessity. Such field experience is invaluable. Finally, of course, it’s also about respect. Without a profound respect for birds I’d argue there’s little pleasure in watching or photographing them. I’m not going to comment here on the technical aspects of post-capture image processing as that’s an entirely different topic. In the end, however, the technical and craft aspects blend and support each other. As one’s knowledge and ability evolve they provide the diligent photographer with the means to approach his or her subjects with reasonable prospects of success. With the advent of digital technology times have changed. Yet what, for me, has changed very little is the enduring delight of being close to wild birds and the pleasure of capturing images of them just being themselves. To consider bird photography through different worldviews helps us to understand some of the many different kinds of motivation involved. Finally we look at what I regard as perhaps the ultimate justification for valuing and continuing with it. Perhaps the ultimate source of, and inspiration for, my own approach to the subject emerges from the following quotation. The beauty and genius of a work of art may be reconceived, though its first material expression be destroyed; a vanished harmony may yet again inspire the composer; but when the last individual of a race of living beings breathes no more, another heaven and another earth must pass before such a one can live again. William Beebe, The Bird: Its Form and Function. This resonant declaration of the intrinsic value of life will, I am sure, appeal to many people, few of whom would deny that it also stands in dramatic contrast to the way that Western Industrial civilisation currently operates in the world. As inheritors of its associated worldview we are all, perhaps, vulnerable to accepting some of its assumptions without much thought. One such is the view that ‘nature’ is no more than a set of ‘resources’ for human use (sometimes known as a ‘utilitarian’ view). Another is that ‘growth’ is an unalloyed good. While we may personally disagree with an outlook and economic system that permits a continuing assault on nature, it clearly remains current – ‘the way things are.’ We can, however, take issue with such a view and adopt others – such as a stewardship ethic. This reflects the view that one of our core purposes is to care for and conserve our natural inheritance. There are at least three contrasting worldviews operating here that reflect the relative narrowness or breadth of our understanding, our world of reference. They are termed egocentric (or self-centred), socio-centric (focused on human society) and finally world-centric (global awareness). Over the years I’ve occasionally met people who are little more than trophy hunters. They tend to approach nature in general, or bird or wildlife photography in particular, a rather nonchalant, uncaring ways. They seem ready to do ‘whatever it takes’ to capture the results they seek. Some might see this as a measure of dedication but I think it more likely a type of addiction. Bird photography in this mode is not really about the subjects at all, rather, it’s ‘all about me.’ The primary focus is on the accumulation of tokens of self-worth. This might extend to submitting one’s images to the local press or participation in photographic competitions. There’s nothing intrinsically ‘wrong’ with such activities. But the drawback for those operating out of an ego-centred perspective is that the subjects can readily become a means to human ends rather than ends in them selves. The establishment of ethical standards for photographers rightly supports moves against such ‘no holds barred’ approaches. People are encouraged to have greater respect and to approach their subjects with care. The practice of working too close to active nest sites, for example, is now strongly discouraged. But it’s a voluntary code and the danger is that a trophy hunting mentality will always be tempted to ignore such injunctions. Socio-centric approaches can take many forms. 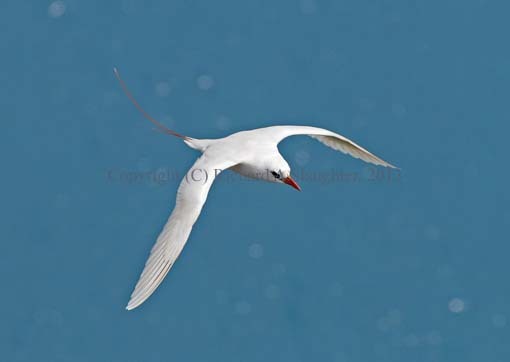 One might, for example, want to capture bird images in order to contribute to an organisation, publication or project. It all depends on the specifics. 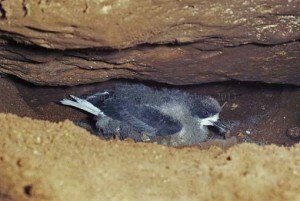 At one end of the scale one can be active in supporting an organisation such as Birdlife Australia whose central goals involve the protection of birds. It is not unusual, for example, for dedicated bird photographers to give away samples of their best work for educational uses. On the other hand one might be willing to provide imagery for commercial enterprises that have no sensitivity to intrinsic value in nature. Indeed, as one looks around it is surprising how widely images of nature and other species are appropriated for commercial or sport related ends. One could see this as grist to the industrial mill, and evidence of cultural insensitivity. Even those who see birds in terms of ecological value (such as pollination or insect control) might vary in their views from the purely instrumental to profound respect. So one must be careful in drawing conclusions about what is going on here. At heart, however, we should be aware that the many options are guided by worldviews and the associated values that powerfully shape what we think and do. A world-centric outlook pre-supposes that we are thinking and acting in the knowledge that we are all part of, and entirely dependent upon, a globally interconnected world. Here notions of selfhood extend beyond the individual and range out in space and time to embrace a much broader and vastly richer world. 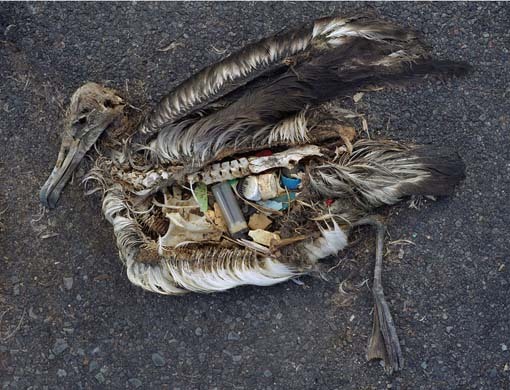 In this context we recognise that there’s no ‘away’ to throw things to and that in nature ‘waste’ is an output of one process that’s also an input to another. 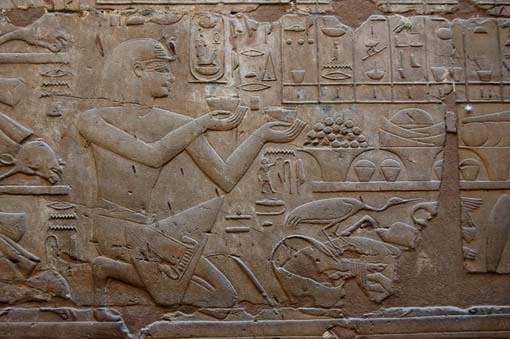 In other words ‘all things are connected.’ The natural environment and its inhabitants are part of the web of life. It is not difficult to see ourselves as part of that wider scene – and by no means its lords and masters. Given such qualitative shifts of awareness any kind of photographic activity in nature becomes transformed – or at least has the potential to be so. It’s no longer about me or, indeed, about human society as such. It may be more like a meditation, a celebration of awareness, an exploration of depth and connection or even a way of paying tribute to something vital or sacred. World-centric outlooks clearly have many implications for what we do and how we do it. To excel at anything suggests that, at some level, we care. There are, of course, many forms of caring. As noted it can be instrumental, focused on short-term ends, or deeply ethical. I tend to think that most bird photographers tend toward the latter. At times they’ll set out with a specific goal in mind. At others they’ll do so simply because they feel involved and, to some extent, responsible. Caring leads them to want to be close to wild birds and to record this engagement in ways that are meaningful to them. Indeed, part of the delight of this work lies in our ability to capture images that record fleeting events that elude the unaided eye. This brings out some of the aesthetic features of birds that are so easily overlooked and makes them more accessible to others. As noted above, my own approach to birds emerged from my years in Bermuda as a young teacher. I was fortunate in that one of my best friends was Government Conservation Officer and trained ornithologist, David Wingate. He, in turn, had spent much of his adult life bringing back a single species – the Bermuda Cahow, or petrel – from the very edge of extinction. Hence my earliest exposure to ‘serious birding’ was infused, through and through, with conservation values and ethics. As a result I still find it hard to comprehend that, as far as the human economy is concerned, birds are basically without value. For many – perhaps even most – they have little reality or significance. 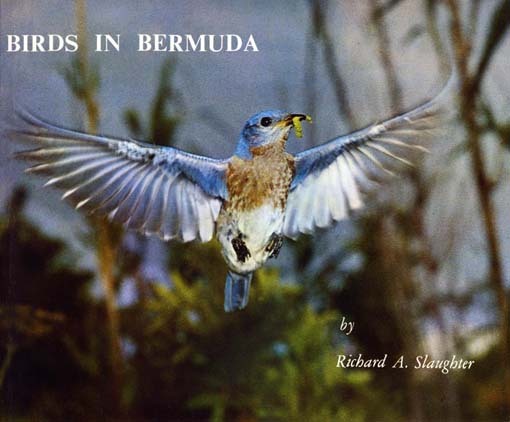 This was brought home to me some years ago when I saw a tourist promo film for Bermuda in which seagull calls from a distant continent had been added to visuals of the local Tropicbirds! Market economics is arguably a sociopathic invention that has benefitted a tiny minority and deprived everyone else. It has no respect for personhood per se and no place for natural process or wildlife. A possible exception to this general rule occurs when conservation and tourism intersect – at which point dollar values may, or may not, play a more helpful role. Again, it depends on the values involved and how they work out in practice. While staying on Nonsuch Island I learned about William Beebe, a then well-known early 20th century US scientist who used it as a base while making a number of pioneering historic bathysphere descents. I found his view of extinction (above) utterly persuasive. The birds we see around us today, the birds we enjoy and seek to photograph are, in fact, survivors of an almost unthinkably long process of adaptation and attrition over centuries. Species lines are centuries – and perhaps millennia – old. 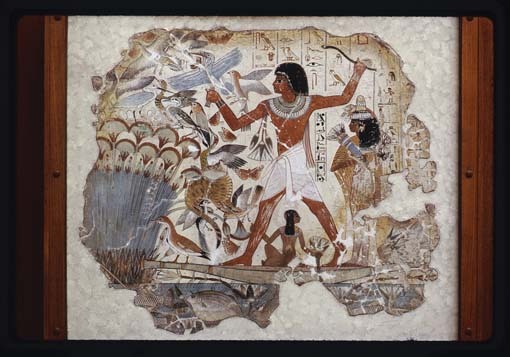 If you go to Egypt and look at the artwork on some of the ancient temples you can see species that look exactly like those living today. Bear in mind as well that this is still relatively recent history. I don’t think it’s generally recognised that each and every bird we see is emergent from deep time. Enfolded within every individual is a genetic record of shared qualities and adaptations, many of which still elude our full understanding. In short, they remind us of the wider, common world that we inhabit and, as such, deserve our deepest respect. The deeper we dig on this subject, the more we find. So if we reflect clearly upon our motivations we may detect what can be seen as a primal need. A need that’s almost universal but buried deep in the subconscious and therefore not always expressed clearly or explicitly. Part of it is a need not to be alone – to be part of something larger – something beyond ego and the ever insistent but contradictory compulsions of modern day consumerism. When we are close to wild creatures in general, and birds in particular, with our minds and our eyes open we have the opportunity to go beyond merely looking at them, as if from a distance. We can choose to see them in depth as unique and incredibly valuable survivors and fellow travellers. That’s when we see them at their best. It’s a world away from romanticising them, from placing their images on pretty postcards, from seeing them diminished as mere decoration. There’s nothing whatsoever romantic about the daily survival imperatives that have sculpted their very existence. We are in fact bound to them in ways that are all-but invisible in ego-, and socio-centric, views. Waking up to that fact sensitises us to whole new worlds of reference and meaning. The truth is that you can access the infinite in your back yard – or down the street. Or wherever you happen to be. Who, for example, among us can say that they truly understand the biology of a leaf, plant or tree in depth and detail? You can also head out of suburbia and find the infinite in beaches, hills, valleys, plains and deserts. One thing is certain. Wherever we go birds were there long before us and have helped to shape the world we so readily take for granted. Hopefully they’ll still be there long after we’re gone. A world without birds would be unliveable. So we owe it to future generations to see, know and value them. Bird photography that is motivated by impulses of this kind can be both ethical and profoundly satisfying at the same time. September and November 2012 newsletters of the Birdlife Southern Queensland Photography group, edited by Tom Oliver, Convenor. William Beebe, The Bird: Its Form and Function, Dover, NY, 1965, p. 18. See Ken Wilber, Integral Psychology, Shambhala, Boston, 2000 for a fine overview of these and related concepts. William Beebe, Nonsuch: Land of Water, Brewer, Warren & Putnam, New York, 1932, provides a rich portrait of the island, its surroundings and the vast number of living organisms that were found there.